WBTF will host its first-ever Coaches Certification workshop on Sunday, July 29th, 2018 in Kissimmee, Florida, USA at the Embassy Suites Hotel, Lake Buena Vista South. This Level 1 workshop is designed to train coaches on how to effectively develop quality twirlers from beginning to elite athletes. There is no on-site registration for the workshop. YOU MUST Pre-register and pay by JUNE 15 through WBTF’s website. No late applications accepted. This program is perfect for athletes, coaches and judges to focus on basic technique, fluidity, and rhythm. This is perfect for our coaches as the first step to help athletes develop a really strong foundation that will reflect all during the twirler’s competitive life. 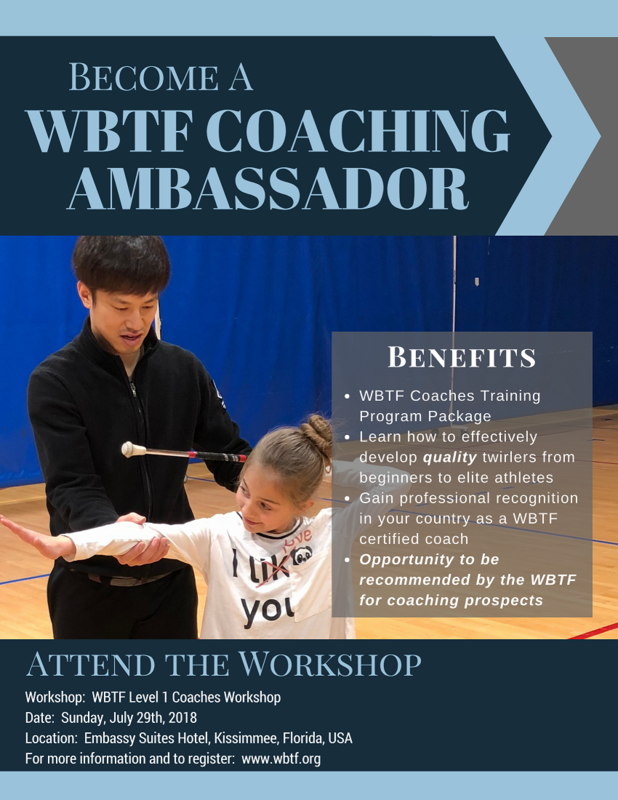 Through this workshop, coaches have the opportunity to become a WBTF Level 1 Certified Coach, gaining professional recognition in your country. Coaches who score from 70% to 84% overall in the testing will become WBTF CERTIFIED INTERNATIONAL COACHES and eligible to participate in the Level 2 education / certification. Testing for certification involves a written multiple-choice test, a practical exam on examples of proficiency for each degree, for elements and for standard solo, along with some live demonstration regarding teaching skills. Your coaches are expected to attend this workshop if they want to have WBTF certification. They are not expected to purchase the Training Program again. They are only required to pay the clinic fee.